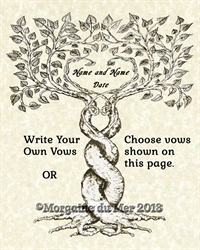 Two trees entwined can be said to symbolize the union of two people that have fallen in love and plan to spend their lives together. Though each tree is a separate entity they grow together and become one. 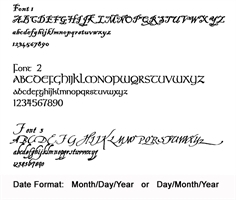 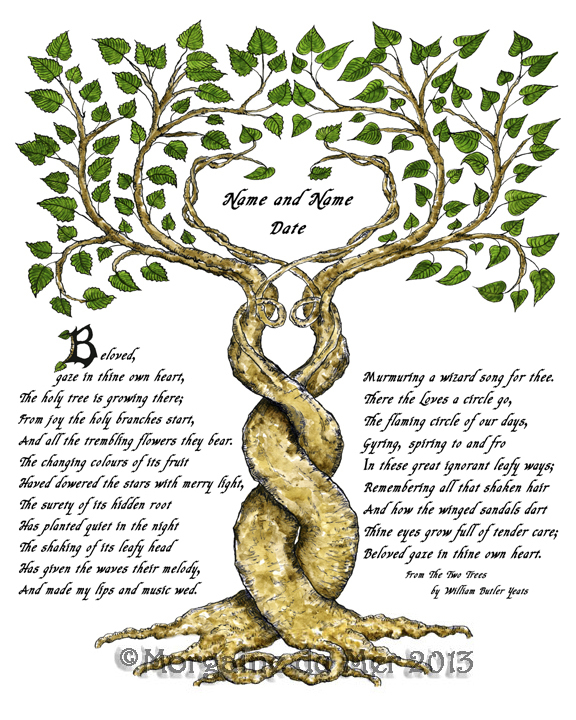 The first verse of "The Two Trees" by William Butler Yeats is imprinted. 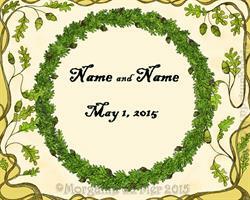 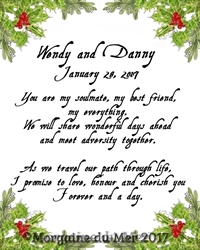 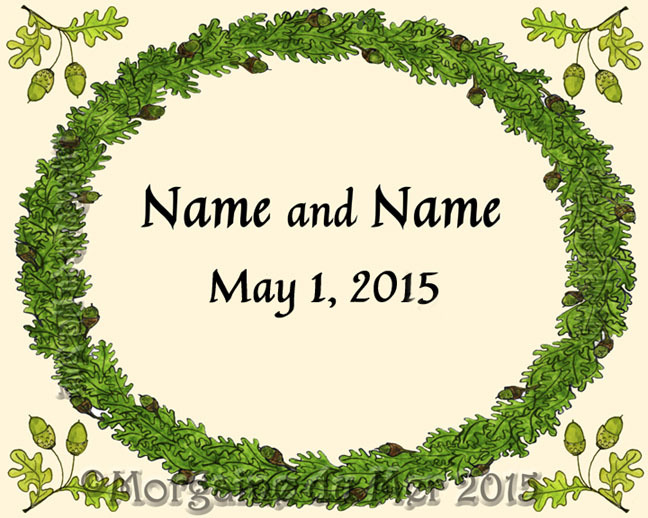 Remember your woodland wedding with a personalized memento. 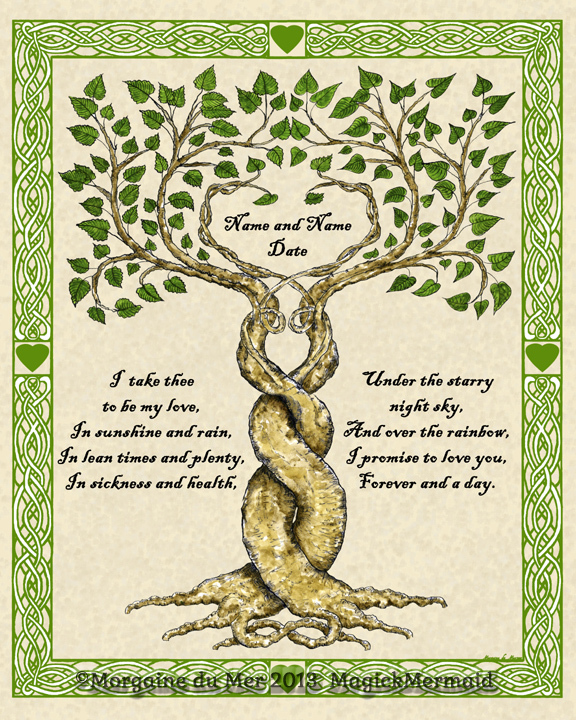 The oak is a long-lived, strong tree and a beautiful symbol of a forever relationship. 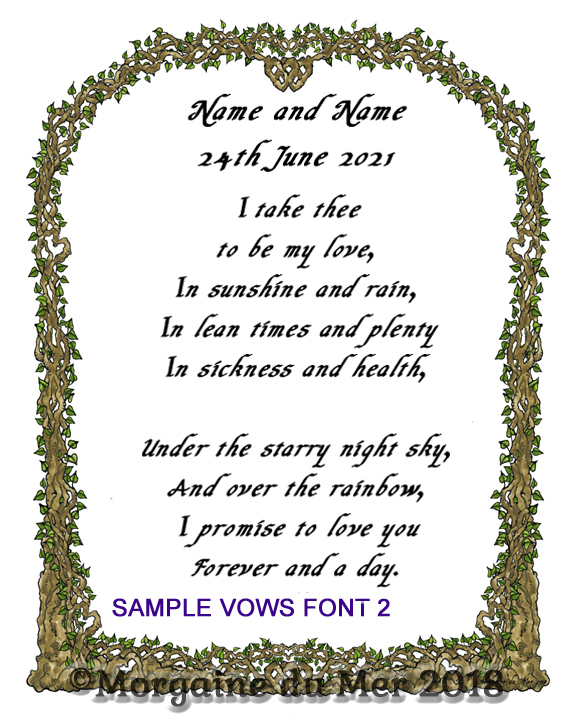 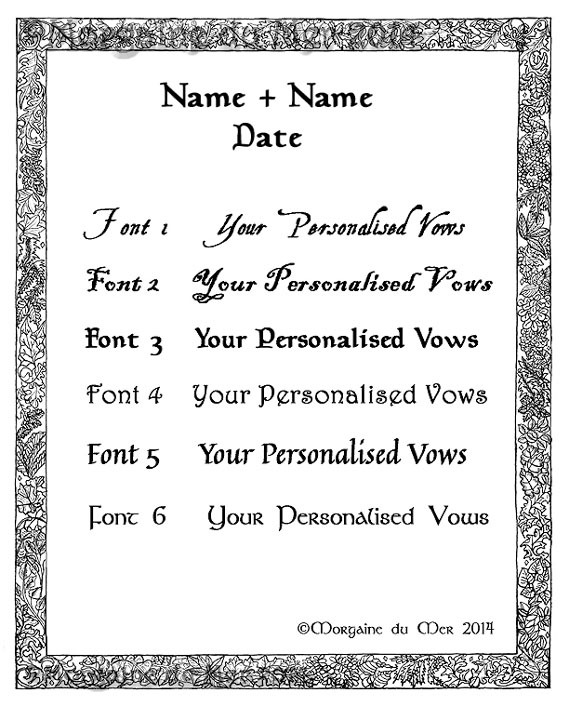 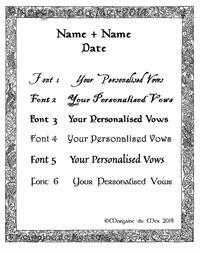 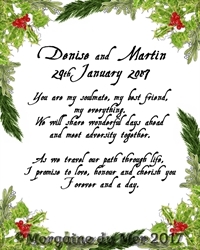 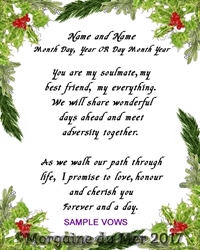 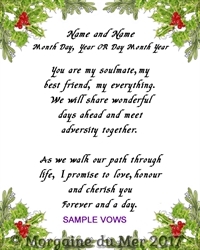 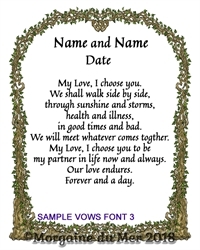 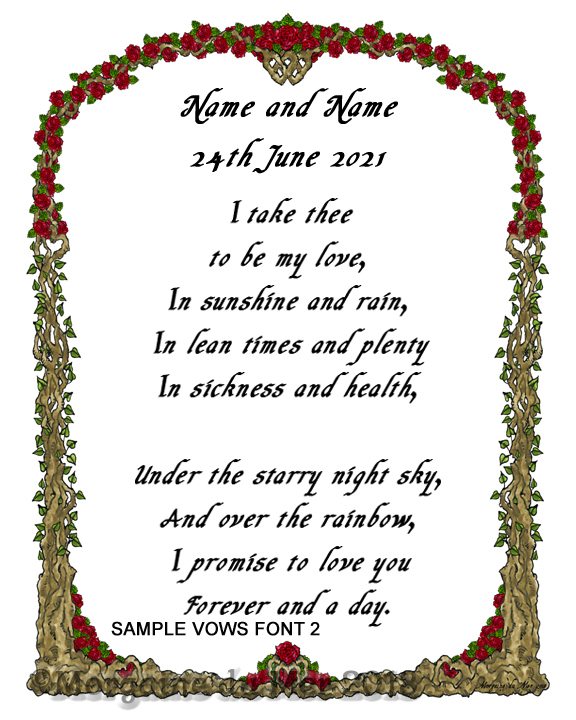 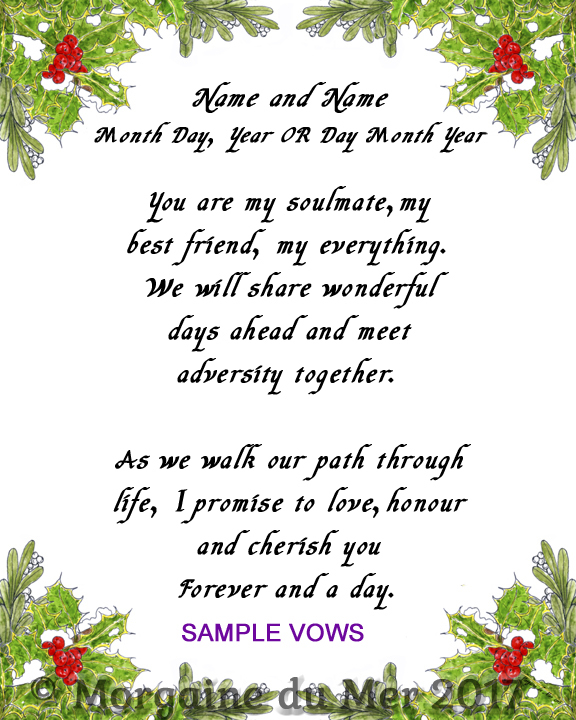 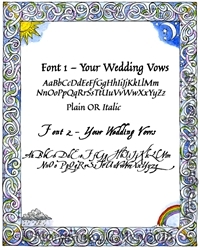 Remember your wedding by the sea with this personalised marriage vows certificate. 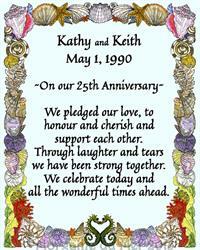 A special anniversary gift or for a couple renewing their vows. 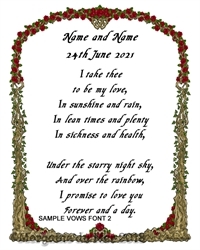 Also a lovely gift for those in the wedding party and guests. 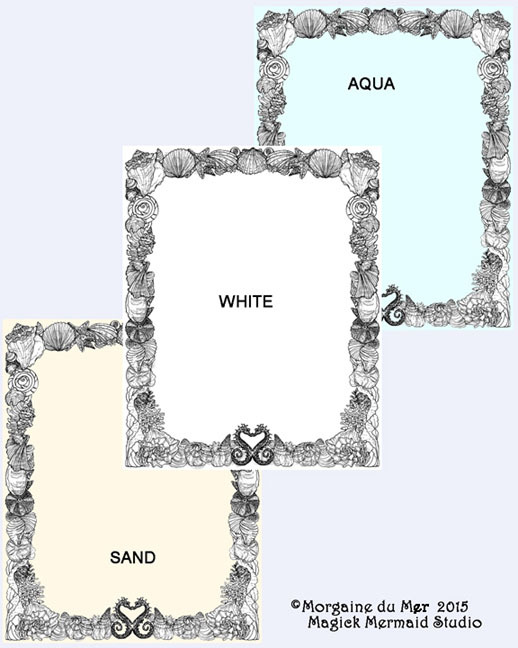 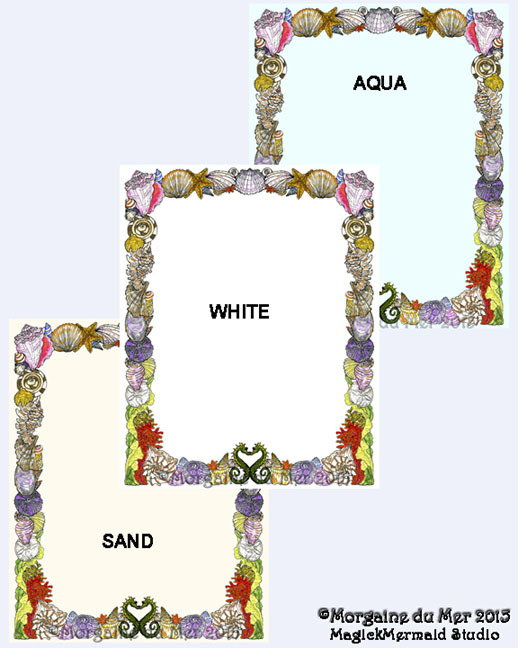 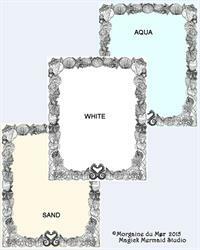 The hand-drawn and painted seashell border is perfect for a beach or tropical themed wedding. 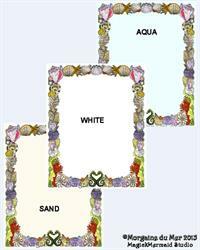 This pathways border was designed to depict all the twists and turns of life. 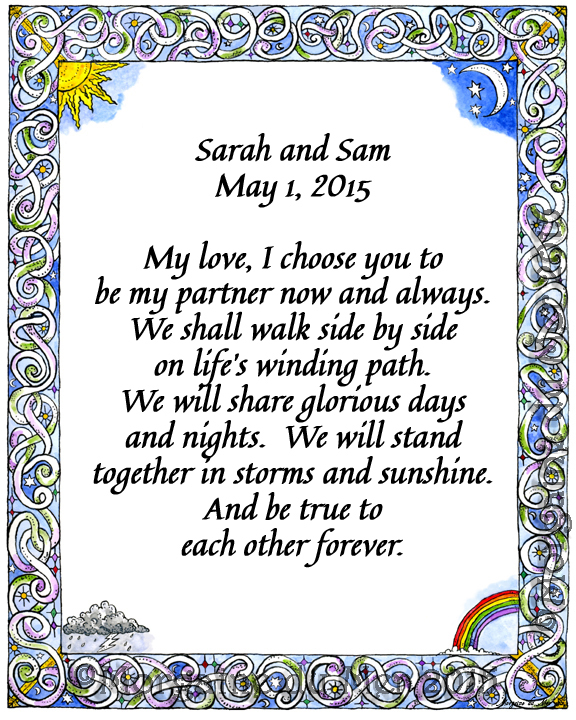 Your chosen partner will accompany you on an exciting journey. 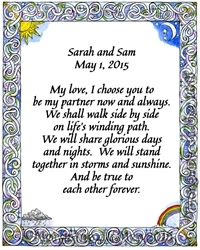 There will be blessed day and nights, plenty of sunshine and rain, stormy seas and rainbows as you navigate your path together. 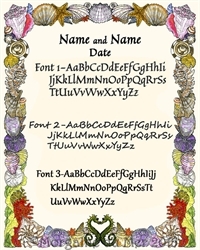 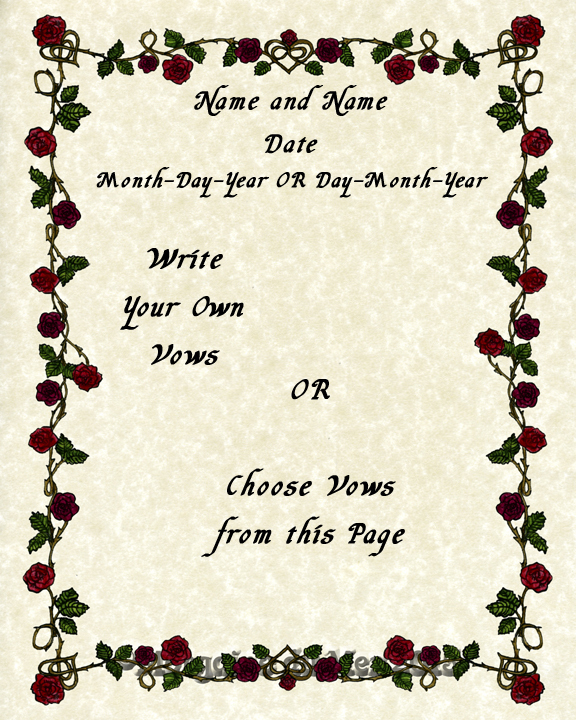 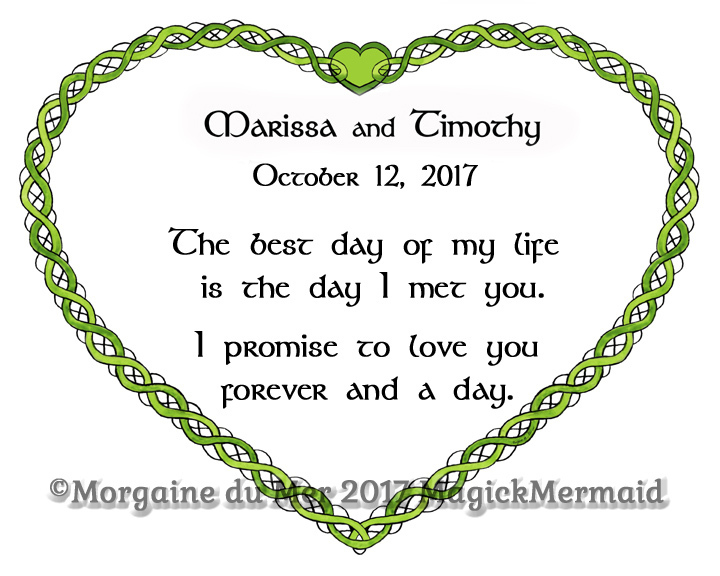 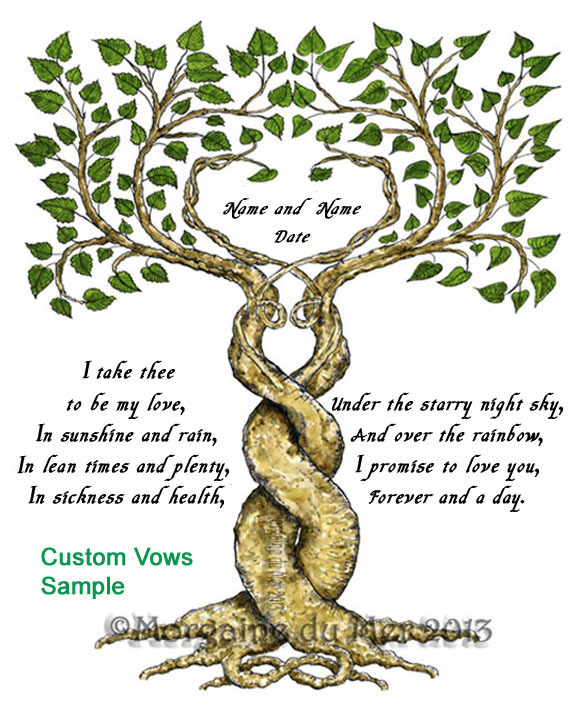 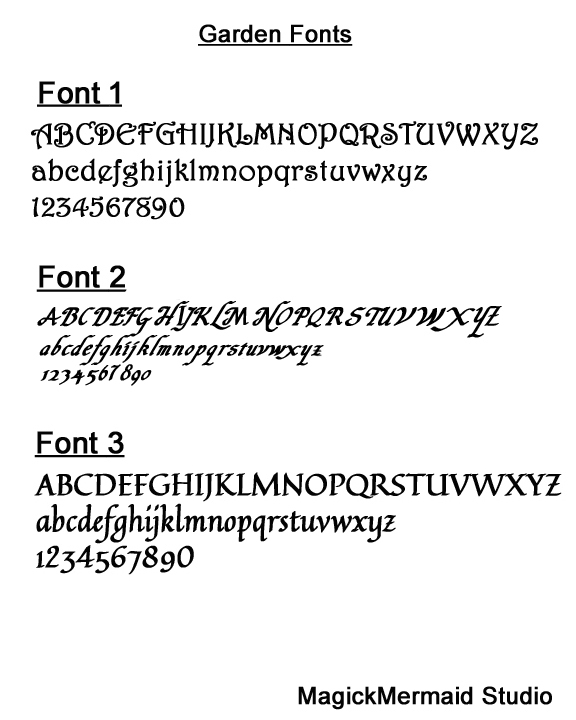 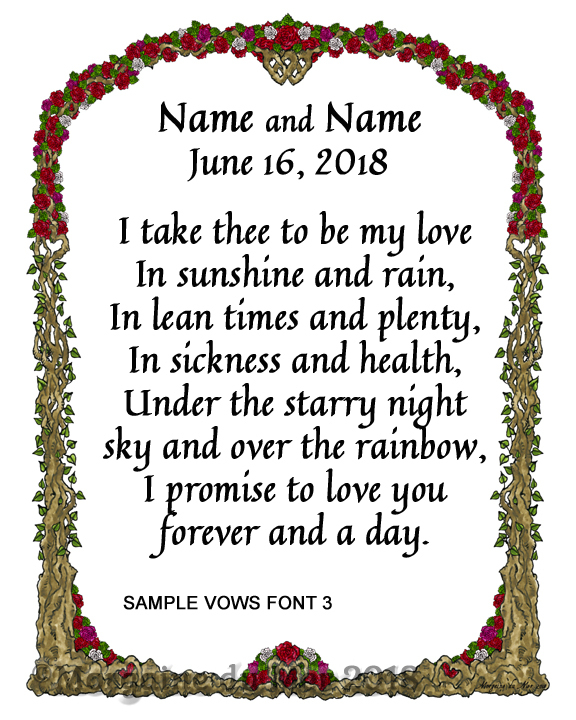 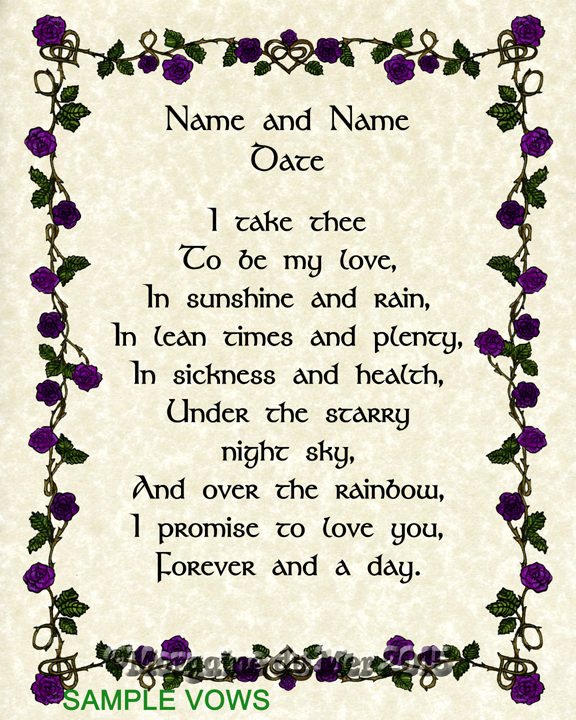 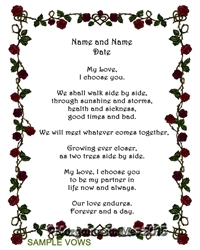 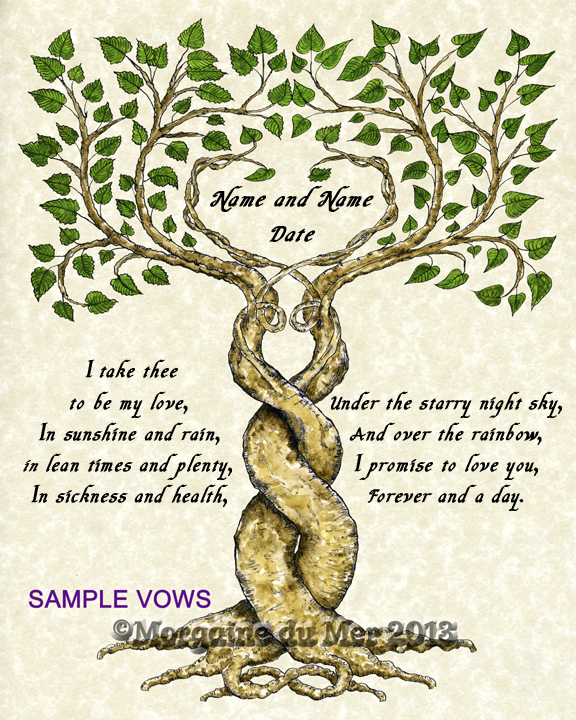 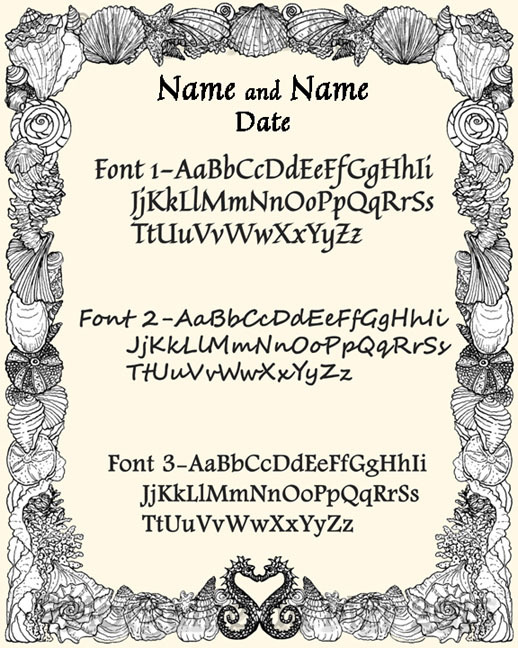 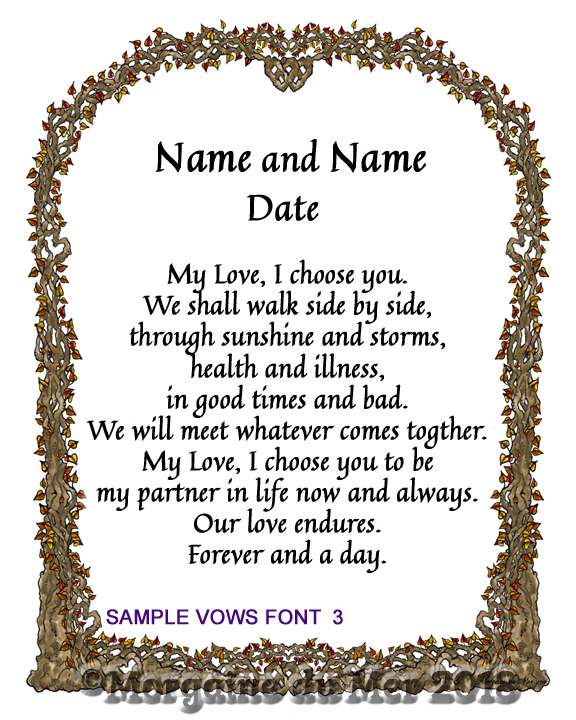 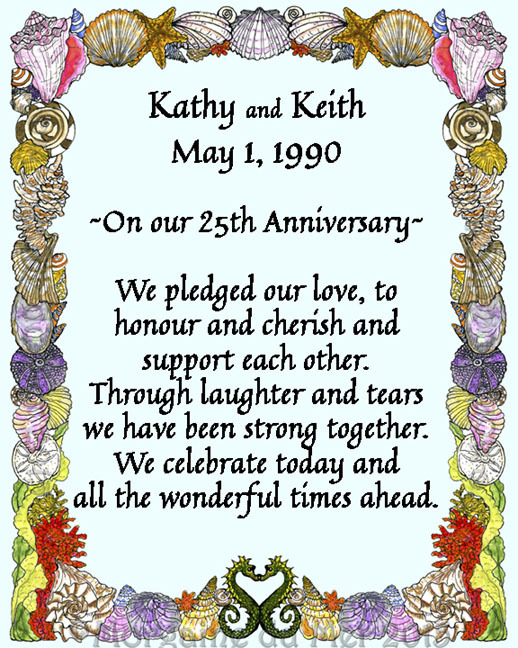 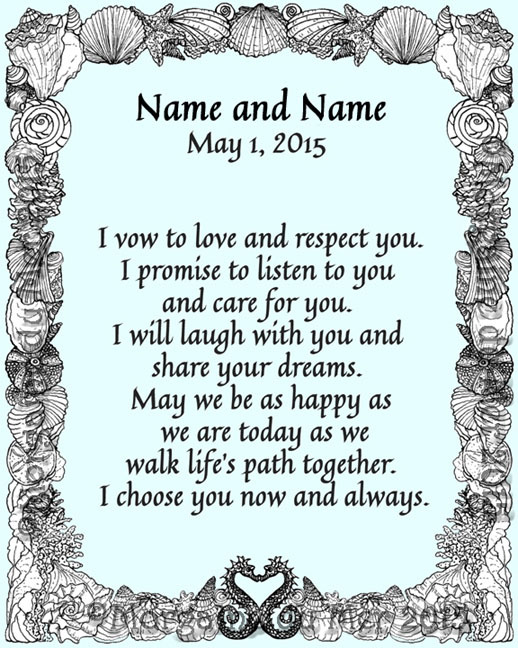 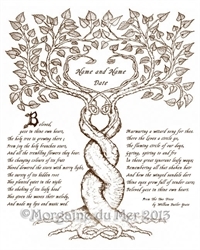 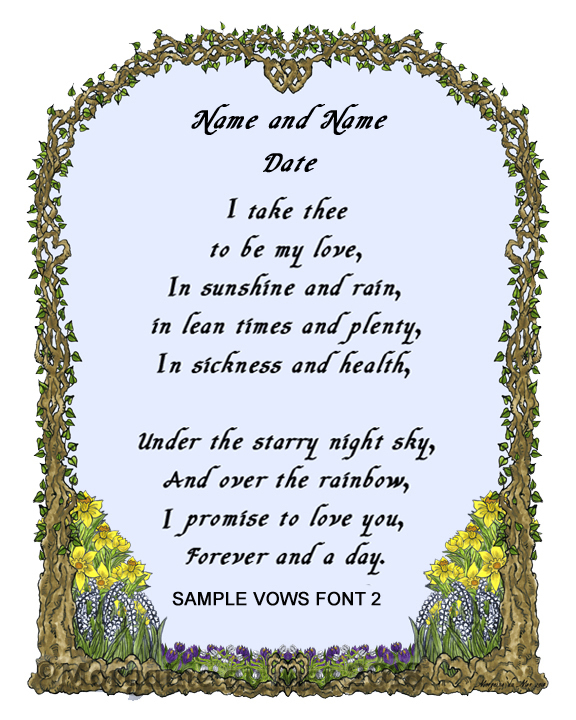 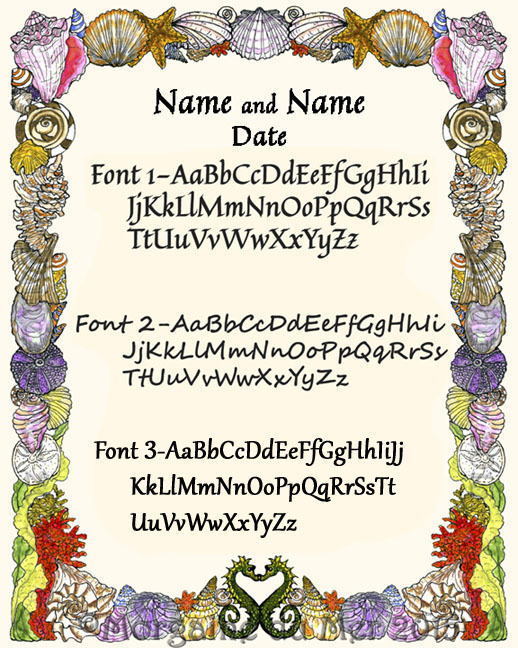 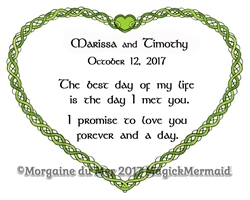 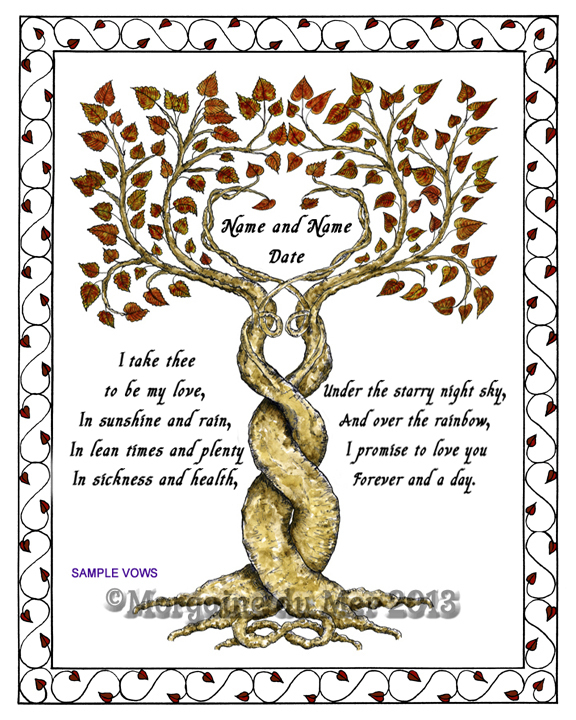 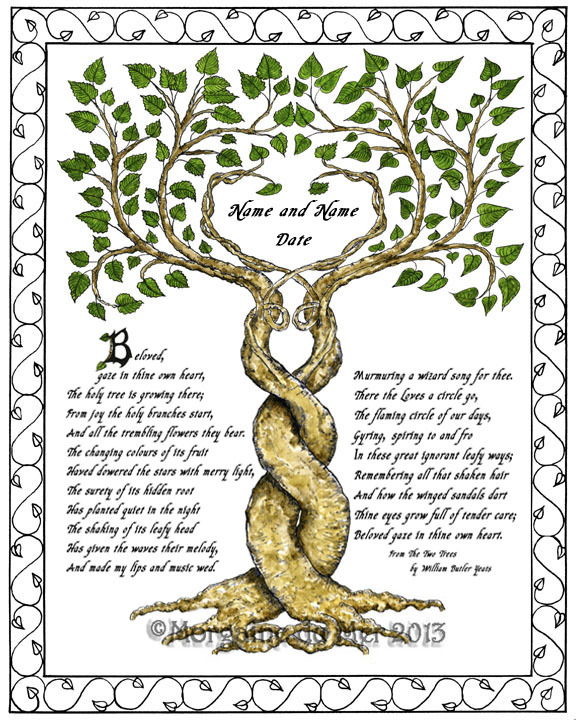 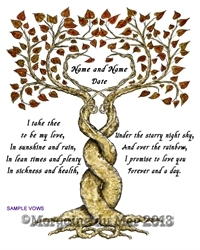 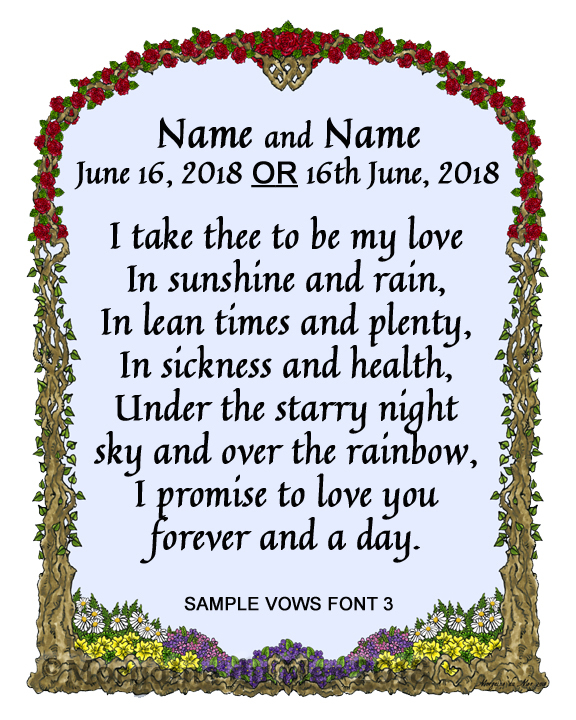 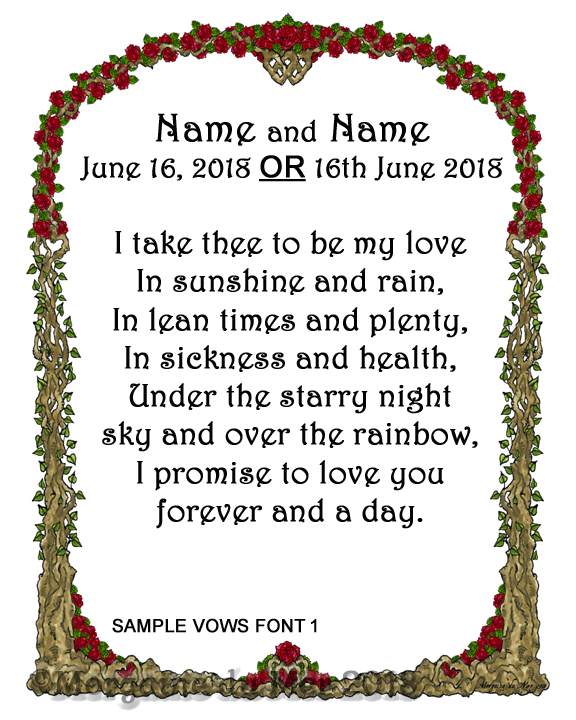 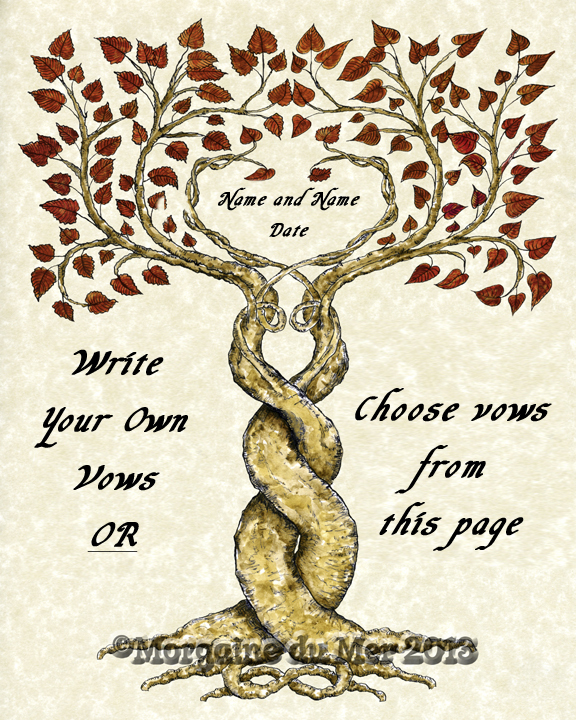 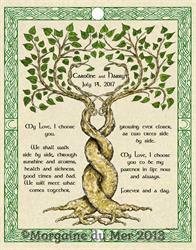 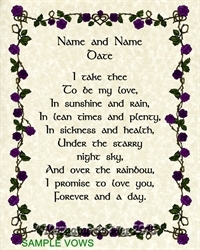 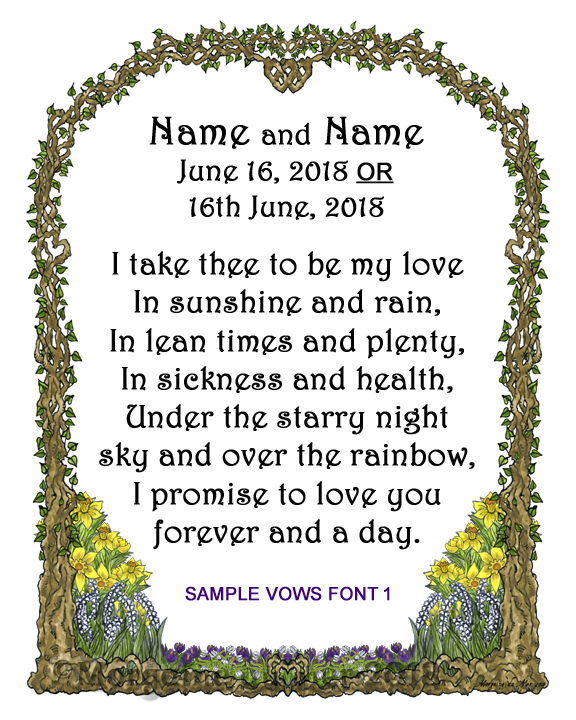 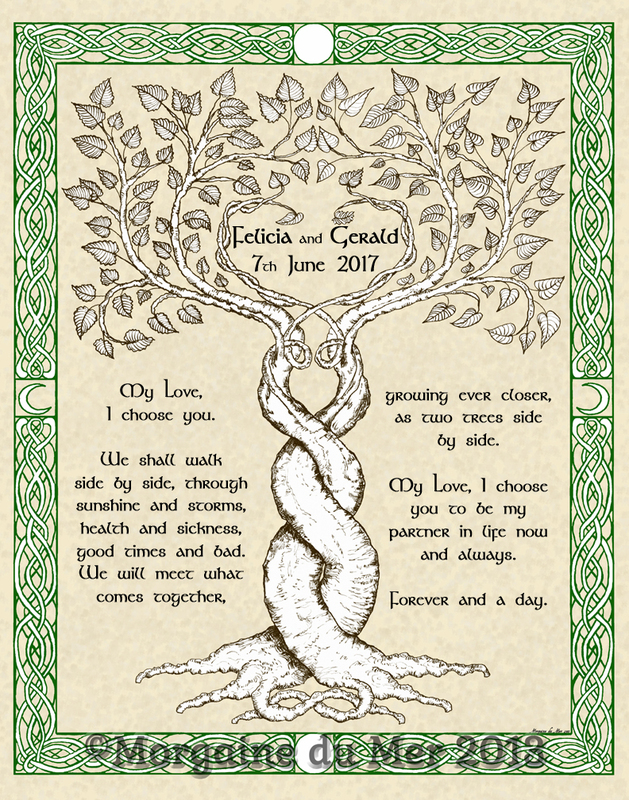 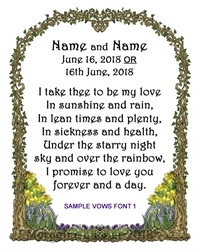 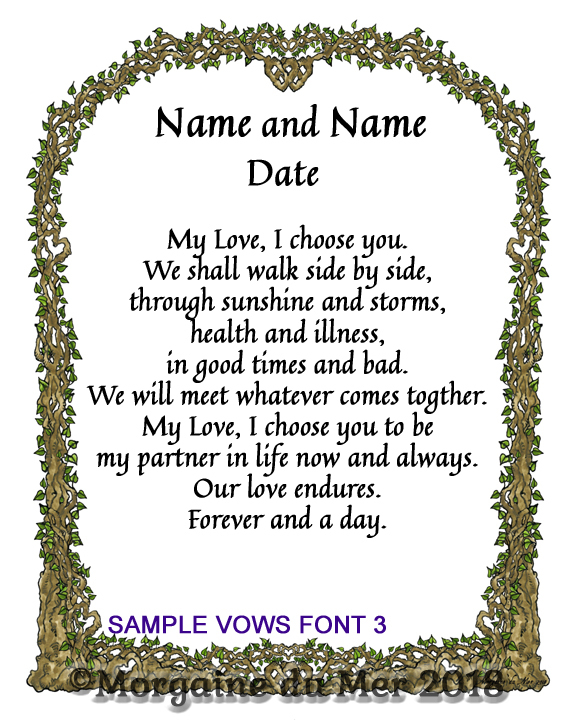 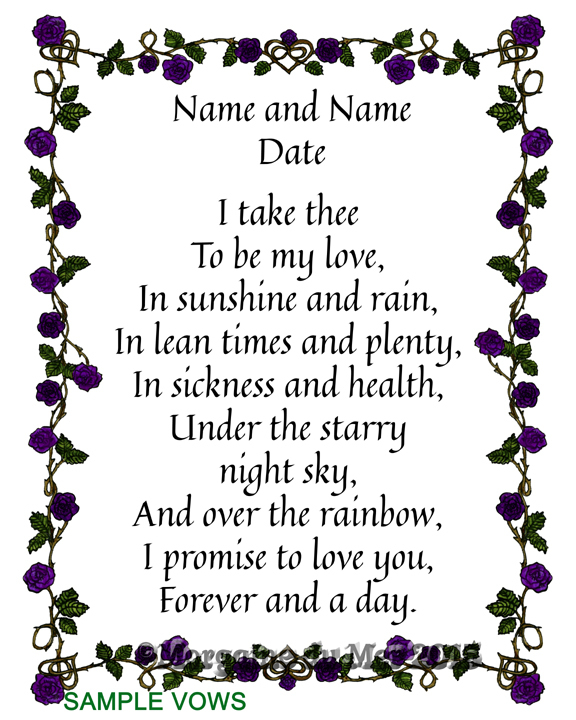 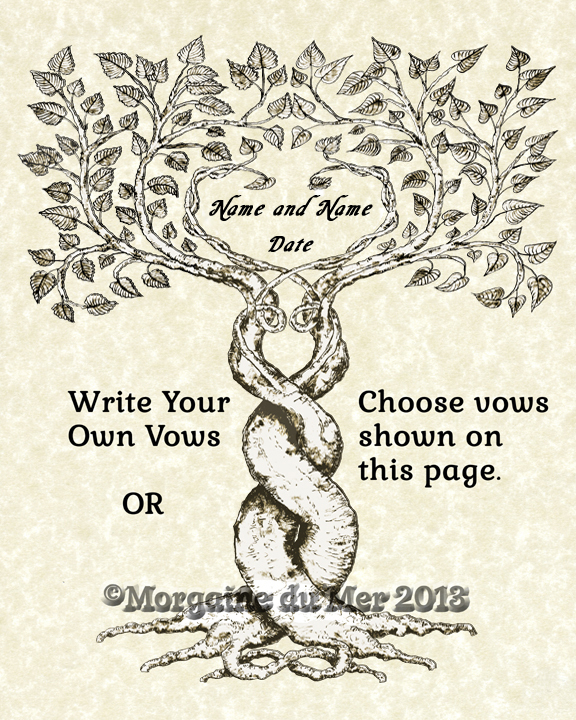 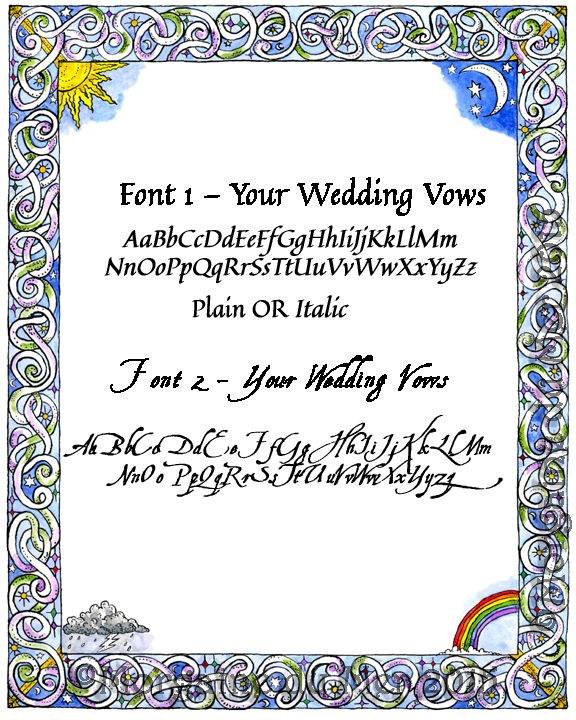 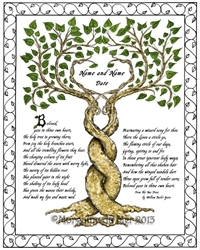 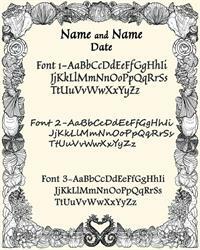 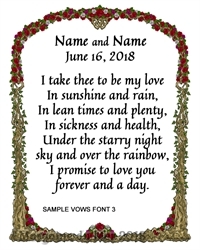 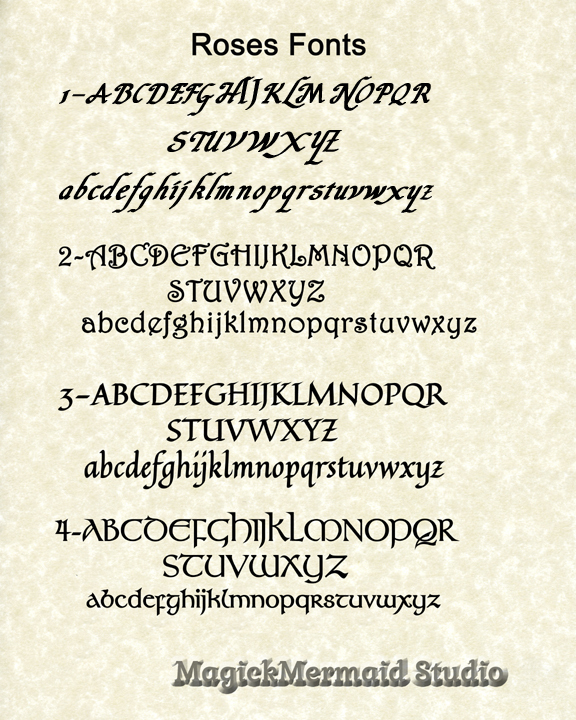 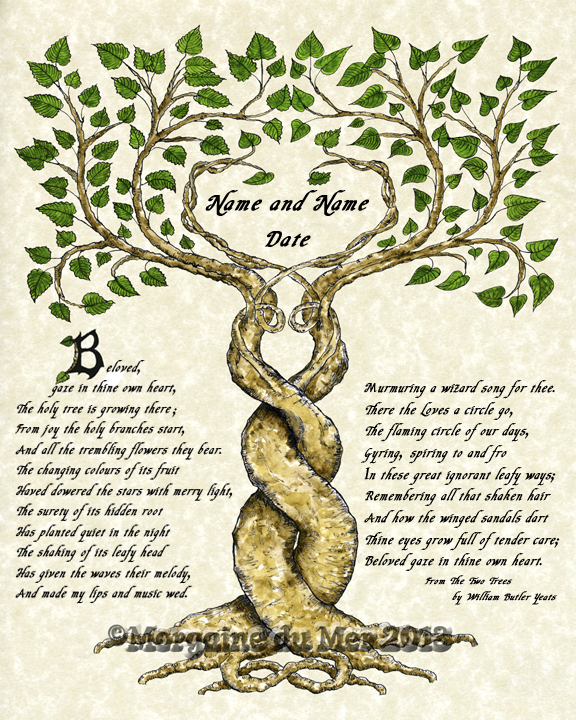 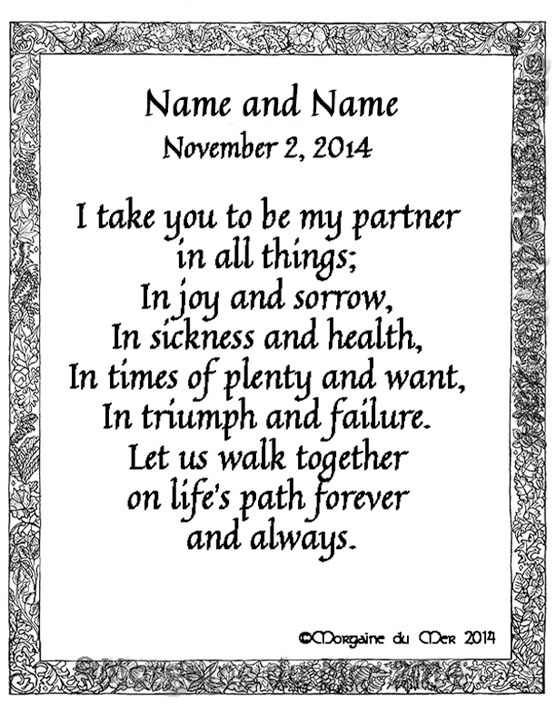 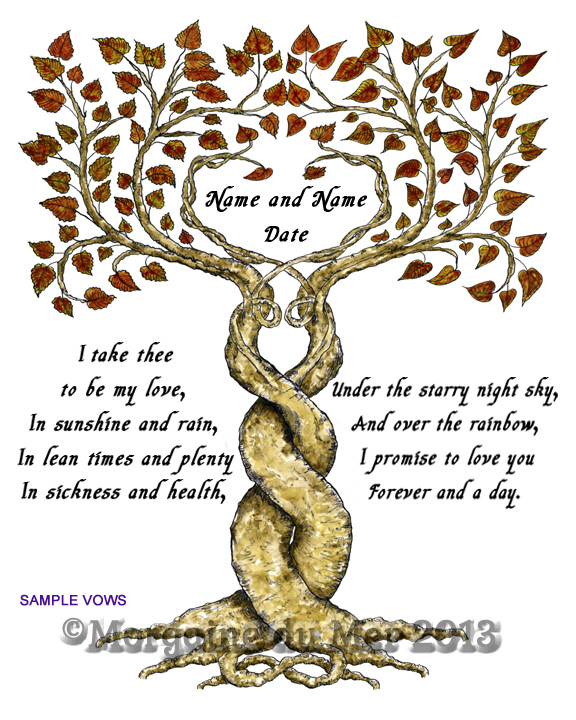 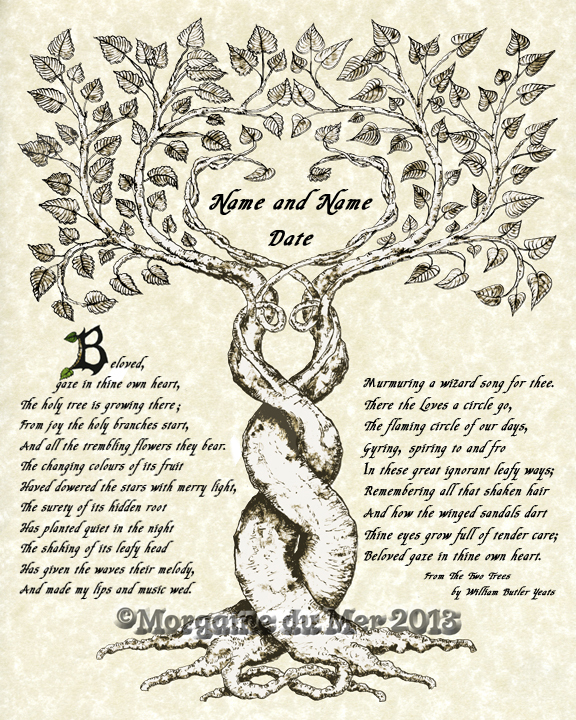 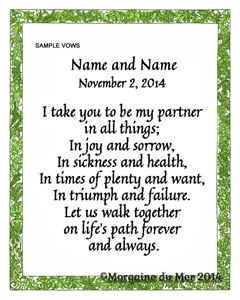 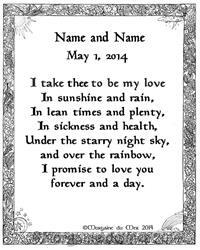 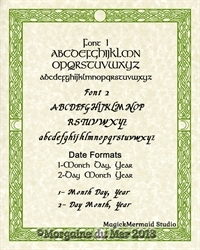 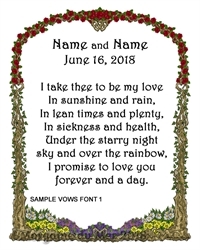 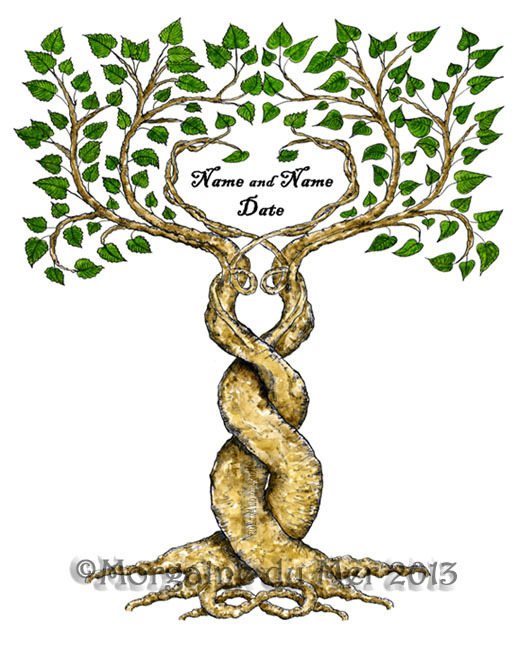 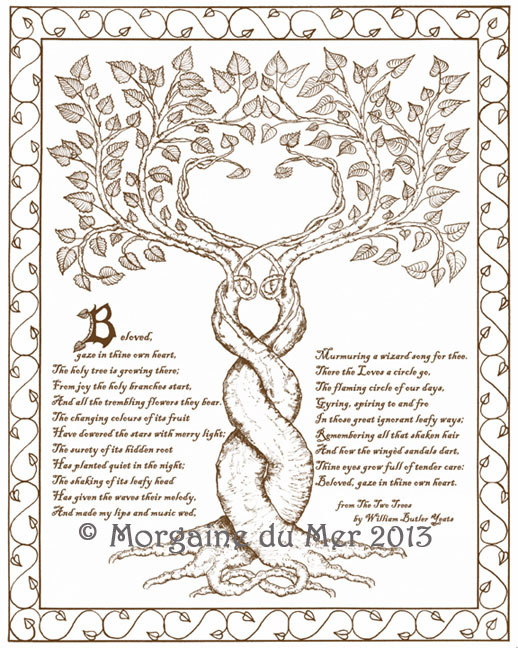 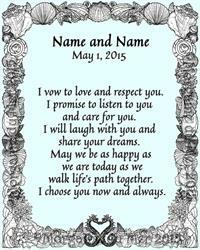 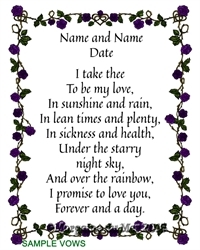 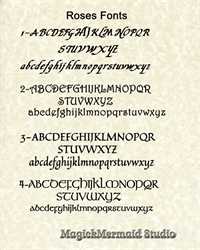 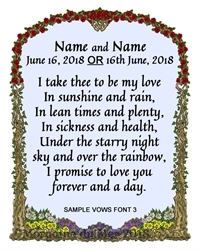 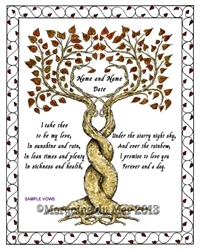 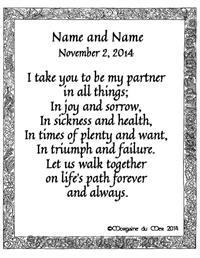 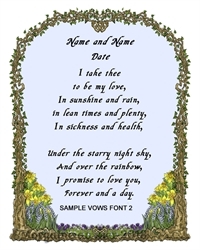 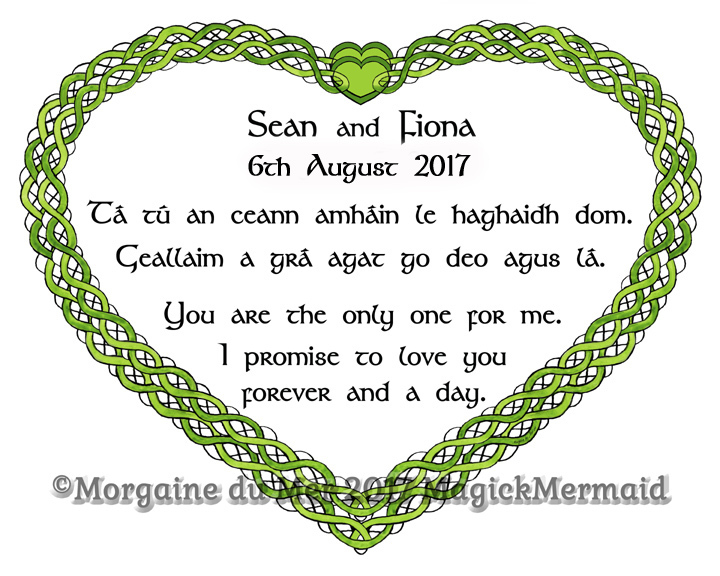 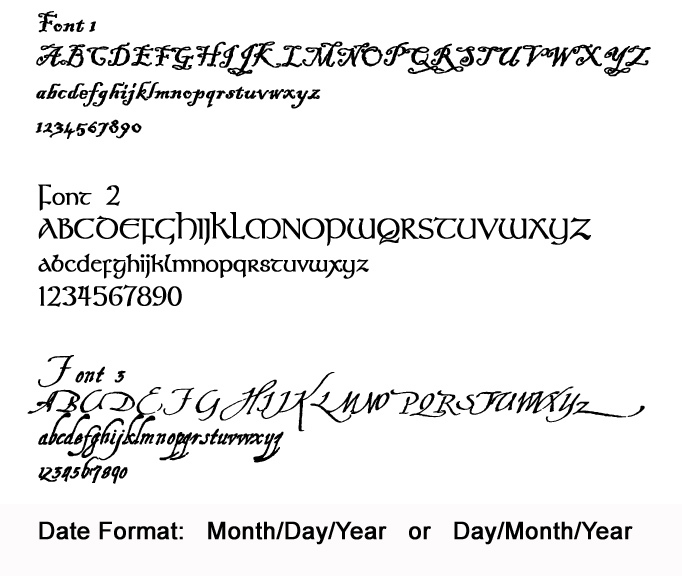 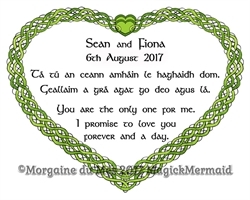 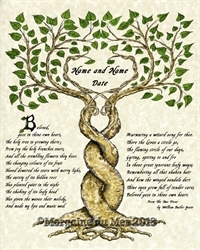 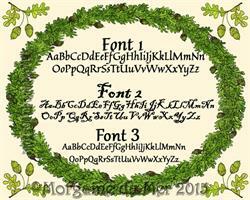 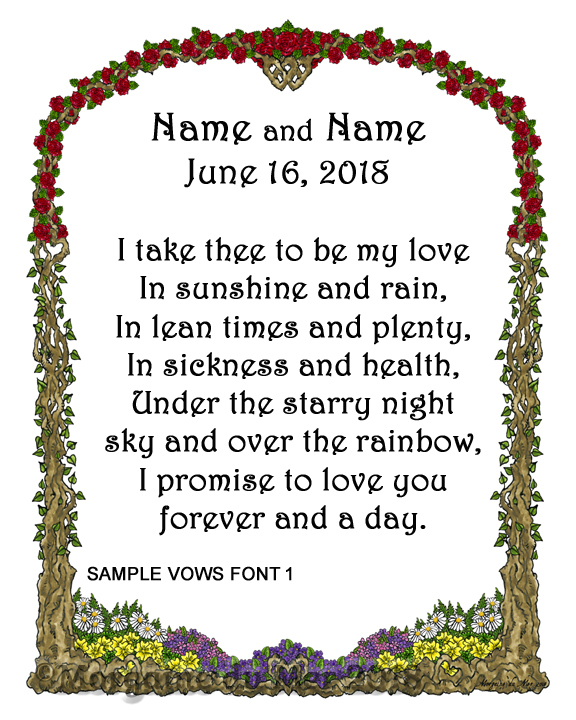 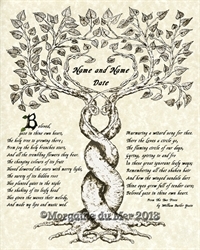 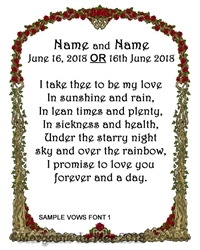 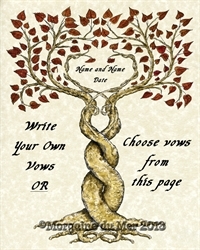 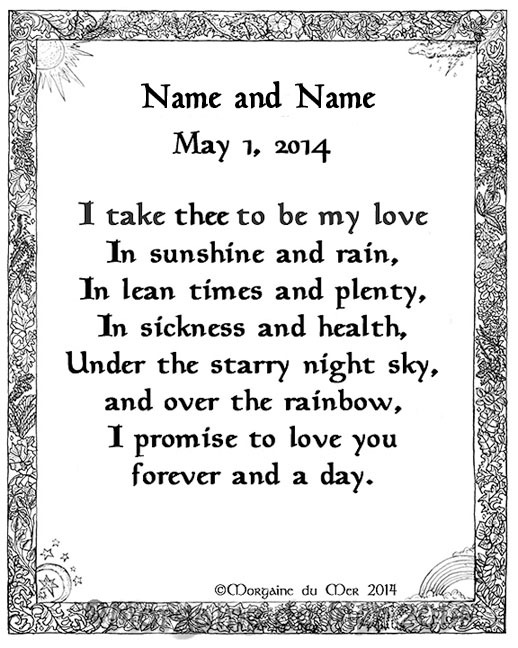 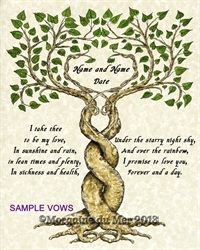 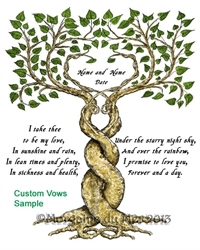 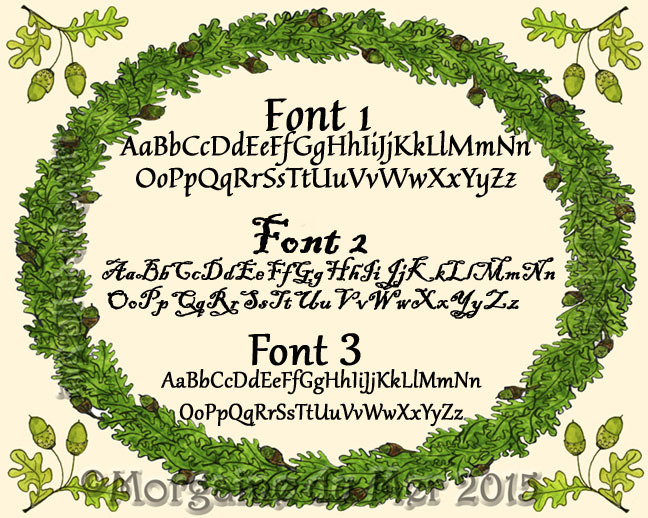 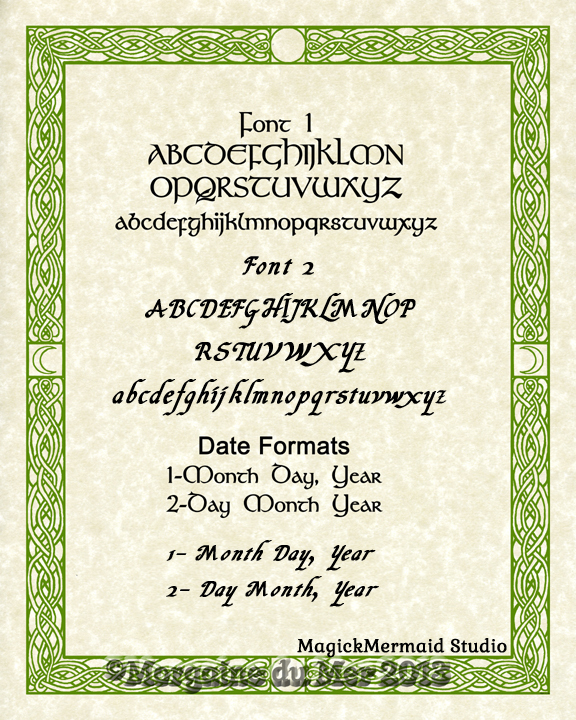 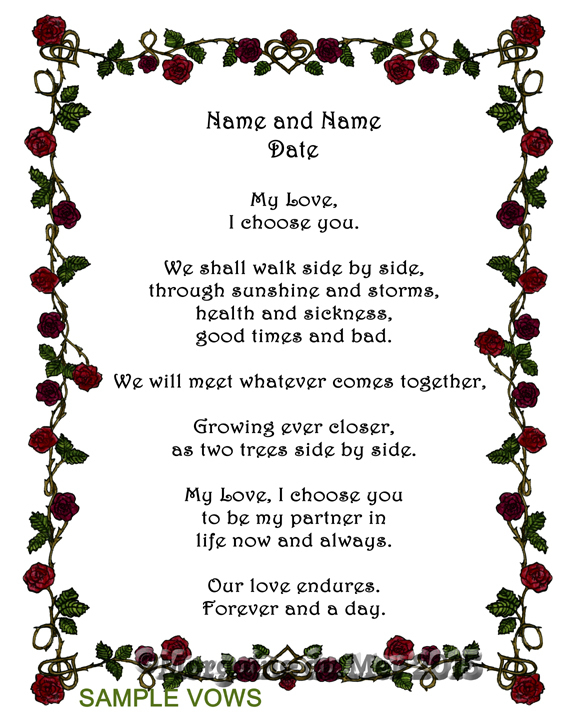 Art Nouveau or Fairytale wedding with custom wedding vows. 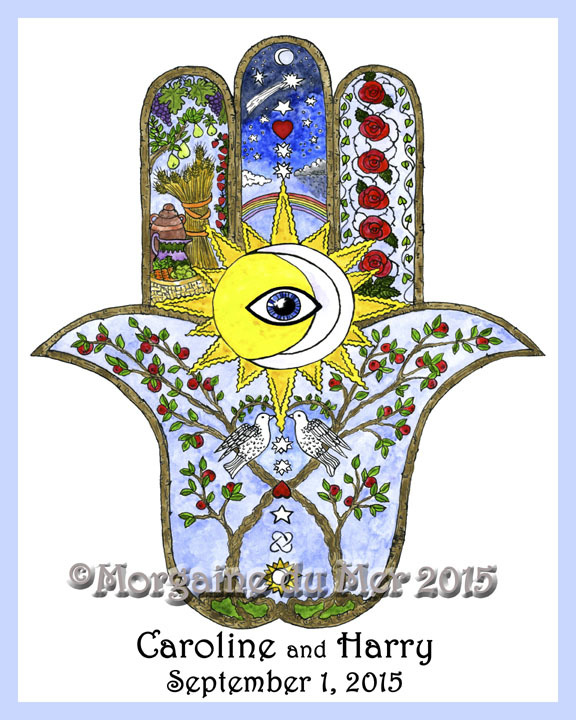 The hamsa is an ancient Middle Eastern amulet associated with protection against the "evil eye" and bringing good fortune, happiness, good health and prosperity. 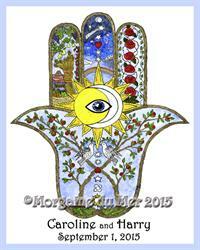 It is also known as the Hand of Fatima, Hand of Miriam, Hand of the All Goddess and the Hand of Mary. 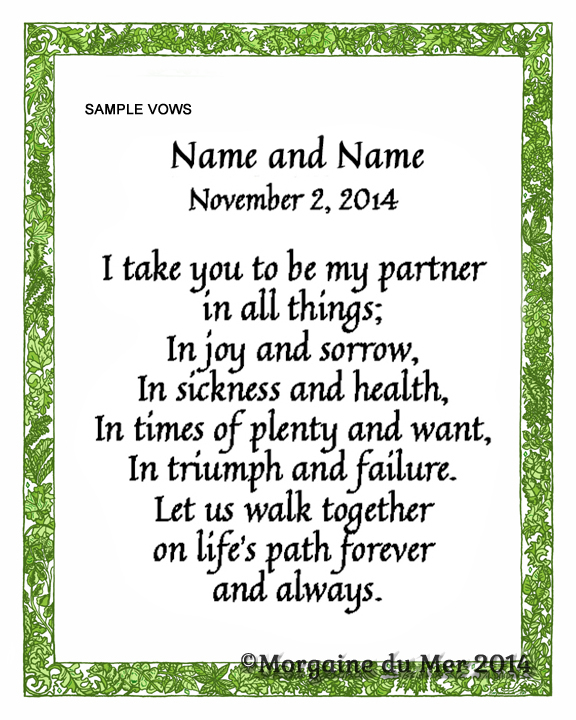 or renewal of vows gift. 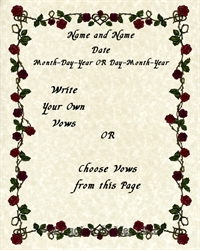 holly, mistletoe and pine branches. The Spring Wedding Garden features the first flowers to emerge after Winter. 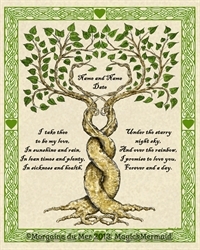 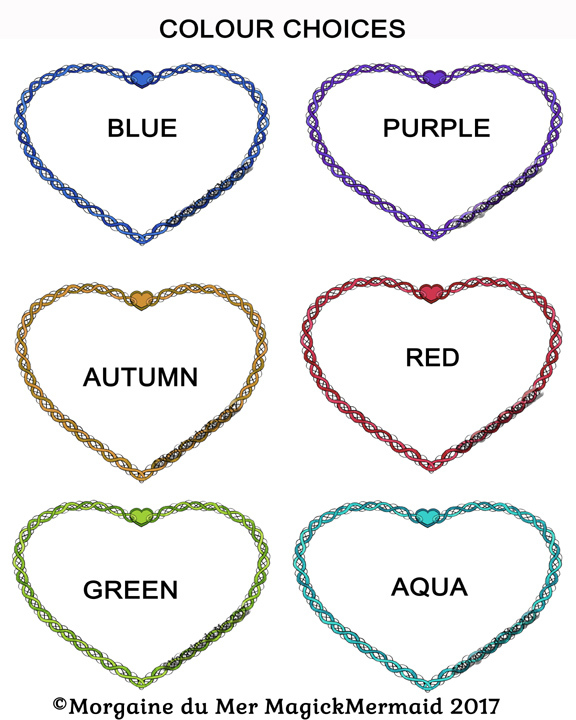 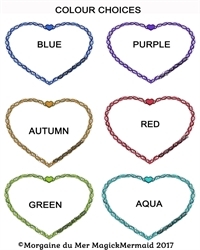 Snowdrops, crocus, daffodils and lily-of-the-valley are framed by entwined branches forming hearts. 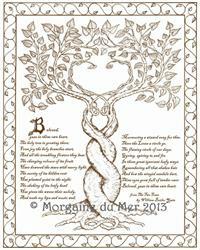 forget-me-nots framed by entwined branches forming hearts. 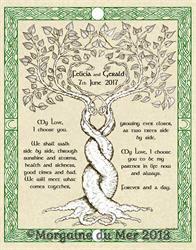 Entwined heart-shaped leaves and branches forming hearts frame your custom vows. 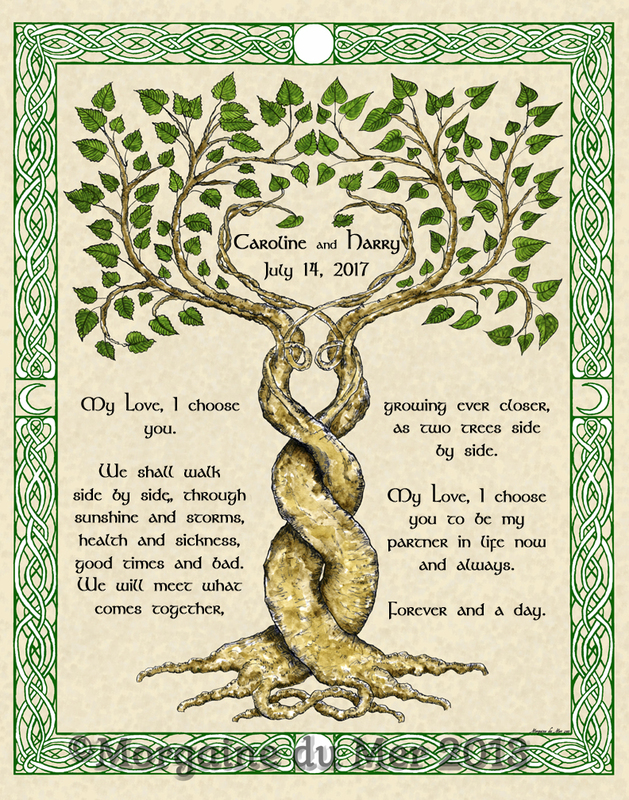 The hand-drawn leafy border represents the greening and growing as couples walk their path together in the sunlight and night time, through stormy days and joyful events.